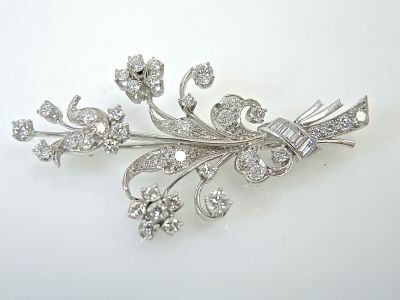 One custom-made platinum and 14 karat white gold floral brooch. Four straight baguette diamonds (0.27 carats: VS clarity: F-G colour). Forty round brilliant cut diamonds (1.60 carats: VVS clarity: F-G colour).